Global Aerospace & Defence Composites market is estimated at around US$ 15.17 billion and grows at a CAGR of around 11.21% to reach US$ 39.46 billion in 2026. The total market opportunity has been estimated at around US$ 252 billion during the forecast period. Commercial Aviation segment which constitutes the fixed wing commercial aircraft is expected to contribute to more than 50% of the market. The developments in this segment in the Jet Engine is expected to contribute to more than 10% of the overall market. The report has been segmented into Region Wise (Including country wise segmentation), Matrix Wise (Commercial Aviation and Defence & Others), Manufacturing Process and Application Wise (Interior and Exterior). The report covers in detailed the PESTLE analysis, where the Environmental aspects in terms of recycling of the composites are expected to be the major trend changer for this market. It is expected that there would be statutory requirements on increasing the usage of recycled or reused composite material. The report “Global Aerospace & Defence Composite Market Forecast to 2026” provides historical data and forecast until 2026. The market forecast section provides segment wise forecast across each of the segments as mentioned above. Scenarios which could affect the growth of the market and the impacts of the Scenarios have been covered in the Scenario Analysis section of the report. The Scenario Analysis covers two Scenarios apart from the expected market movement for the forecast period. Market Overview: This section covers the current state of market and the past developments which have helped in paving the market. In this section deals with Commercial Aviation and Defence separately and has a comparison of various programs which have used composites. This chapter also deals with the key requirements across platforms and the design demands. Technology Overview: This chapter deals with the key technologies which would affect the sector, the technical challenges which have been identified are repair, Design and Structural Stimulation, Crashworthiness, Manufacturing, Recycling and Modelling to name a few. Market Segmentation: In the chapter the market segmentation which have been used in this report have been mentioned in detailed. The market forecast is done based on the segmentation levels in this chapter. Market Analysis: The market analysis chapter deals with the key industry trends which includes drivers, restraints and challenges which is expected to shape the growth of this sector are discussed in detailed. Supplier Mapping: Supplier mapping across the key composite suppliers have been mapped, supplier mapping includes 8 Commercial Aviation suppliers and 6 Defence programs. 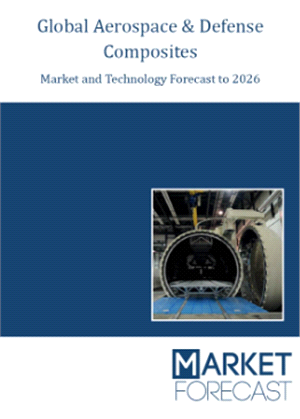 Market Forecast: This chapter deals with the expected market growth, the segments covered are Region Wise (Including country wise segmentation by End User), Matrix Wise (Commercial Aviation and Defence & Others), Manufacturing Process and Application Wise (Interior and Exterior) with separate forecast for the segments mentioned. It is interesting to note the paradigm shift from Prepreg Preparation method to RTM in the forecast period. Scenario Analysis: A detailed scenario analysis has been captured as a part of this chapter, three scenarios have been considered. The assumptions of each scenario and the expected market impacts have been covered in this chapter. Opportunity Analysis: This chapter covers the high growth markets and the areas the companies should be focussing on to maximize the revenues. The opportunities have been classified as High, Medium and Low Opportunities. Company Profiles: Detailed Company profiling have been covered for the key players in the market, the company profiles include company information (Including products and Services), Company Financials, Contracts won, alliances and a detailed SWOT of each of companies. There has been a constant struggle to optimize the operational cost of airlines, majority of the operational cost was accounted to fuel and to reduce the cost associated with fuel was of significant priority. This increased focus on reducing the weight, which is usually directly proportional to the fuel efficiency has paved the way to advanced composite aircraft which are 50% composite aircraft. The defence market is at a higher maturity in terms of composite usage compared to Commercial Aviation market. The environment driven initiatives which are intended to regulate the emissions from airlines are expected to be the major driver, it is expected that such initiatives will be implemented across the other region. The program wise supplier mapping across the major commercial and defence programs are covered in Supplier Mapping Section of the report. PEST analysis have also been covered as a part of the report, the major companies in the Aerospace & Defence Composite Market have been profiled and a detailed SWOT of each company has been covered as a part of the report.